On November 30, 2009 telecommunications company Flow, in association with the Shaggy & Friends Foundation launched their very own channel “Shaggy & Friends TV” on FLOW 394. Shaggy & Friends TV will be dedicating its airtime to highlighting the artistes that have committed their talents in support of raising funds for the Bustamante Hospital For Children. At 3pm on November 30th the station signed on with clippings of the first annual Shaggy and Friends concert that was staged earlier this year on the lawns of Jamaica House. 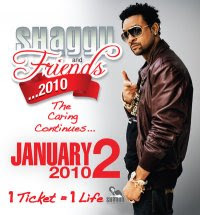 Members of the Shaggy & Friends Team have contributed their services both in cash and kind to the staging of next year’s charity concert set for January 2, 2010, with tickets available at various ticket locations island-wide. Shaggy & Friends TV promises to give updates on the many projects leading up to event. The channel will also feature a host of music videos from the artistes both local and international. Additionally, viewers will have a chance to see behind the screen clips of production meetings with sponsors, visits to the Hospital and many more.